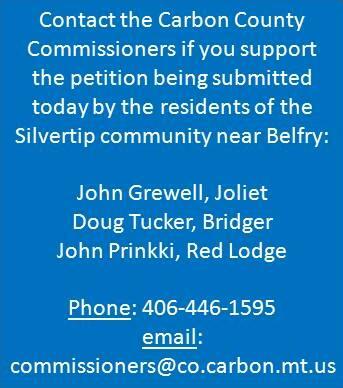 This morning residents of the Silvertip community in Belfry will be presenting a zoning petition to the Carbon County Commission. Please go to support them if you can (details here). The petition is the result of months of hard work by a local grass roots group — community organizing, education, legal research, and much more from tireless volunteers. What exactly is happening in Carbon County? How is this authorized by state law? What are the requirements for a special district? How will the special zone be administered? What happens once the petition is submitted? Why is this zone necessary? What are the Silvertip landowners asking for? What are highest and best management practices? Why should the oil and gas operator have to pay for testing of water, air and soil? Isn’t this an unnecessary government intrusion into private property rights? There are a lot of federal laws that protect us against air and water pollution. Aren’t these enough to keep us safe? Energy Corporation of America (ECA) is a large oil and gas company with years of operating experience. Why not just let rely on them to be professional stewards of our land and water? What about the mineral rights holders? Isn’t it fair for them to be able to get their oil out of the ground? I have read that fracking is a 50 year old mature technology that is completely safe, and that there has never been a documented case of water contamination due to fracking. Are claims of environmental risk just scare tactics tactic by environmental activists? What are the risks of being close to a fracked well? Isn’t this all theoretical? Are there really documented cases of these impacts to people who live near oil and gas wells? The oil and gas industry says that environmentalists use scare tactics instead of facts to try to block oil and gas drilling. Is that true? Q. What exactly is happening in Carbon County? A. A group of landowners in the Silvertip area around the Belfry well have signed a petition asking the Carbon County Commission to create a special zone with rules for oil and gas drilling. Q. How is this authorized by state law? This is similar to laws in other Western states. The owners of natural resource rights have a protected ability to get those resources out of the ground. However, Montana law provides for local control in Mont. Code Ann. 76-2-101: “Whenever the public interest or convenience may require and upon petition of 60% of the affected real property owners in the proposed district, the board of county commissioners may create a planning and zoning district and appoint a planning and zoning commission” to administer the district. This is what the Silvertip residents are asking the Commissioners to do. Q. What are the requirements for establishing a special district? A. Citizens can request a special zone when 60% of the landowners in the zone sign a petition requesting it. This petition then goes to the County Commissioners, who, after a public hearing, must agree to move forward and create a planning and zoning commission (PAZC). Q. How will the special zoning district be administered? A. If the County Commission accepts the zone, it will set up a special Planning and Zoning Commission to administer the policies and procedures of the zone. The Commission will be comprised of two local residents of the zone, the three County Commissioners, and two elected officials. Q. What happens once the petition is submitted? A. The Carbon County staff will look at all the documentation submitted by the Silvertip residents, and verify that signatures are properly collected and the land to be included in the zone is properly defined. The Commissioners then have 15 days to set up a public hearing to approve the zoning request and move forward to set up a Planning and Zoning Commission for the district. Q. Why is this zone necessary? A. It is necessary because federal and state laws and regulatory bodies like the Montana Board of Oil and Gas are weighted far in favor of oil and gas operators. These laws deprive local landowners of their rights, resulting in loss of property value, the risk of water contamination, and dangers to personal health. Local efforts are the only way for landowners to level the playing field. Q. What are the Silvertip landowners asking for? A. 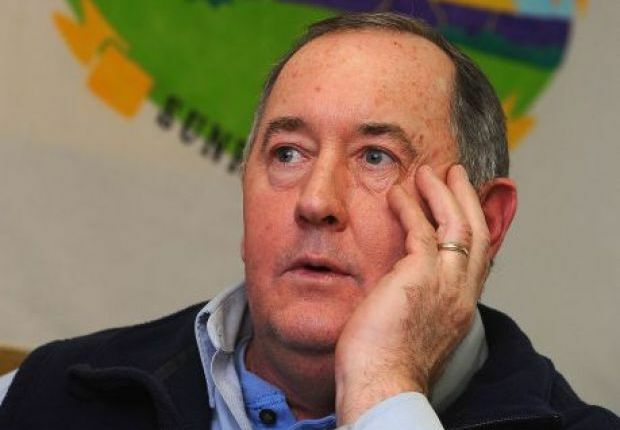 The residents are requesting that a special zone be established that requires oil and gas operators to adhere to the highest and best management practices in conducting oil and gas operations within the district. They are not asking for a moratorium. They are asking only that their property, water and health be protected from unnecessary damage due to oil and gas operations. Q. What are highest and best management practices? Minimum spacing. Well bores must be at least a mile apart. Well design. Wells must be designed using a closed-loop system, with no holding or reserve pits or ponds permitted. Flaring. Flaring (burning off natural gas) from the well bore is not permitted, except when necessary to protect public health and safety, and well bore venting or any other atmospheric discharge is to be reduced to the maximum extent possible. Placement of well pads. Well pads should be located to minimize impacts to the visual and scenic views of the surrounding landscape. Noise. Sound suppression for any equipment making significant noise, including compressors, so that the noise level, at any time of operations, does not exceed on average during a twenty-four (24) hour period 78 dB and does not at any time exceed 85 dB. Water quality testing. Comprehensive water testing at least once every three months during the period of active well operation, and at least once a year for the next 20 years following completion for every water well within three miles of each well bore. The testing is to be done at the expense of the oil and gas operator, and the results must be provided to the PAZC, which shall publish the results on a public web site. Testing must be conducted by an independent Montana state licensed engineer. Air quality testing. Comprehensive air quality testing at least once every three months during the period of active well operation, and at least once a year for the next three years following completion at sites within two miles of each well bore. The testing is to be done at the expense of the oil and gas operator, and the results must be provided to the PAZC, which shall publish the results on a public web site. Testing must be conducted by an independent Montana state licensed engineer. Soil testing.Comprehensive soil quality testing at least once every three months during the period of active well operation, and at least once a year for the next three years following completion at sites within a two mile radius of each well bore, and at all points along the surface above the (horizontal) well. The testing is to be done at the expense of the oil and gas operator, and the results must be provided to the PAZC, which shall publish the results on a public web site. Testing must be conducted by an independent person qualified to evaluate the soil quality. Q. Doesn’t Montana law Provide for the standards above? A. No. The state of Montana provides insufficient regulatory support for important protection, such as water quality and quantity, air quality, and public health. In addition, the Montana Board of Oil and Gas Conservation (BOGC), the primary state agency responsible for permitting wells, is designed to promote the drilling of wells for profit. What’s more, the residents of the Silvertip area appealed to the BOGC before the Belfry well was permitted, but there were no substantive modifications made to the permit based on their concerns. Q. Why should the oil and gas operator have to pay for testing of water, air and soil? A. This is a fundamental issue of fairness.The impact of drilling is not confined to the specific lot where the well is located. Water, air and soil can be contaminated in nearby land that has no connection to the drilling. Should a landowner with little financial stake in the drilling have to pay thousands of dollars for this testing even if he receives minimal compensation from oil extraction? If the testing isn’t supervised, there is no way to determine whether any contamination resulted from the drilling or another source, so the landowner will have to pay for the cleanup without opportunity to receive any compensation for damages. No, the cost of determining whether there has been environmental damage should be a cost of doing business for the oil and gas operator. It is only in this way that the land, water and air can be protected after they leave. Q. Isn’t this an unnecessary government intrusion into private property rights? A. The government has already intruded into private property rights by creating laws that make mineral rights dominant over surface rights. This requires the surface owner to give up use of his land without permission, and can put the owner in danger of losing property value, of being in violation of mortgage covenants or not being able to get insurance. Q. There are a lot of federal laws that protect us against air and water pollution. Aren’t these enough to keep us safe? A. Between 1970 and 1990 there were many federal laws designed to protect our environment. Since that time the oil and gas industry has been successful in becoming exempt in very significant ways from these laws. An example is the Halliburton Loophole, passed in the Energy Act of 2005, which exempts oil and gas from having to disclose the chemicals used in fracking, which are now protected as “trade secrets.” Oil and gas is also exempted from basic environmental laws like the Safe Drinking Water Act, Clean Aire Act, Clean Water Act, and NEPA. Q. Energy Corporation of America (ECA) is a large oil and gas company with years of operating experience. Why not just let rely on them to be professional stewards of our land and water? A. It’s true that ECA has a long history as an oil and gas operator. Unfortunately that history is full of compliance violations and fines in other states. In Pennsylvania, which keeps detailed records and posts them online, ECA has had 66 inspections with violations, 90 separate violations, and 55 enforcement actions, and been levied over $80,000 in fines. You can download a copy of the report to see for yourself. 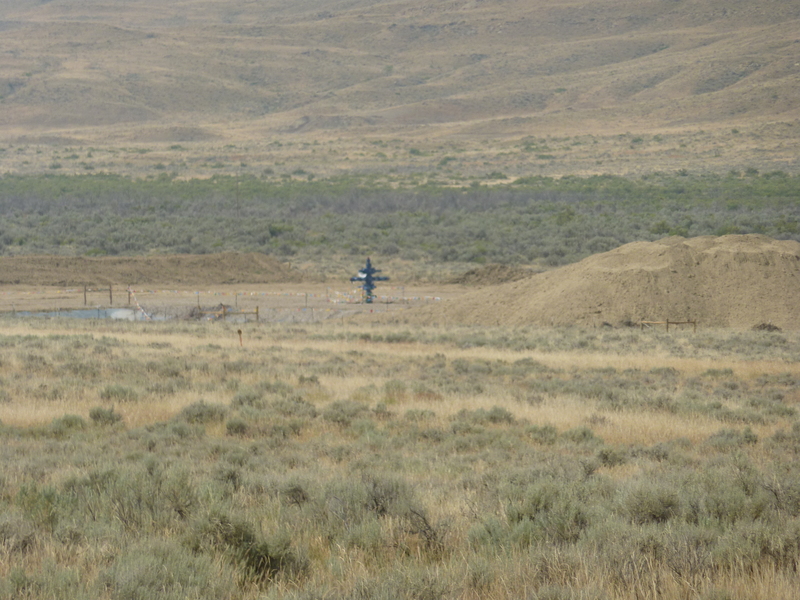 And when ECA began drilling the well at the Belfry site in June, they immediately got involved with a vendor who took water illegally from a local source and had to be shut down by the Montana Department of Natural Resource Conservation, which received many calls and emails from vigilant local residents. This is a company that clearly regards spills, leaks and fines as a cost of doing business. It is entirely reasonable for landowners near this well to want to establish legal measures to protect themselves. Q. What about the mineral rights holders? Isn’t it fair for them to be able to get their oil out of the ground? A. There is nothing in this petition that keeps mineral rights holders from extracting their oil. All this special district would do is require that ECA and other operators follow highest and best management practices, and that their compliance with those practices be monitored and enforced locally. As long as operators follow these practices, the mineral rights holder will be able to extract oil. Q. I have read that fracking is a 50 year old mature technology that is completely safe, and that there has never been a documented case of water contamination due to fracking. Are claims of environmental risk just scare tactics by environmental activists? A. While it is true that fracking technology, which involves the injection of toxic chemicals into rock, has been used for many years, it is the use of the newer technology of horizontal drilling that has greatly expanded the risk for residents living near a well or above a horizontal bore hole. These advances in technology have brought the heavy industry of oil and gas drilling closer and closer to where people live. Today over 15 million people in the United States live within a mile of an oil and gas well, leaving them exposed to these risks. A search on this blog of the term “water contamination” will lead you to plenty of documented material. You can also look at the Zotero database, which provides plenty of peer-reviewed scientific studies that document water contamination. Q. What are the risks of being close to a fracked well? Fracking is highly water intensive. A single well requires over 2 million gallons of fresh water that is then treated with chemicals. This water can never be reused or returned to the hydrologic system, so it is gone forever. In Montana as in many areas of the country, fresh water is scarce. This is not an idle concern. When the Belfry well was first drilled, ECA worked with a contractor who used local water without a water right. Wastewater from fracking is stored in injection wells or storage facilities. There are many documented cases of water leaking out of storage and migrating into groundwater. ECA has been cited for improperly lined storage pits in Pennsylvania. In Belfry the pit is in a clear drainage that experiences regular spring gully washers, running through neighboring farms and ranches. Local residents brought this up to the Board of Oil and Gas without being able to get any protections in the permit. Methane, nitrous oxide and other compounds can leak from the well site into the air, or be intentionally “flared” or burned off, creating dangerous exposure for local residents. In a recent case, a jury awarded $2.9 million to a family that suffered severe negative health effects because of being exposed to poor air quality caused by living close to a well. If you drive up Silvertip Road to Elk Basin, where wells are currently operating, you can smell the pungent odor of these compounds. Drilling is a 24×7 activity. 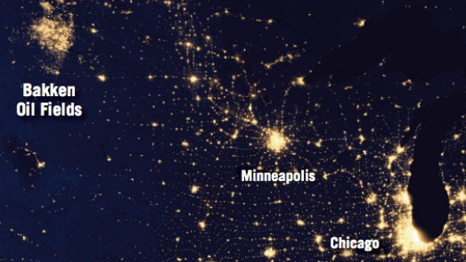 Activity requires light around the clock and is very noisy, creating disturbances for local residents, and potentially harming livestock and crops. Drilling causes loss of habitat for wildlife. A single well results in the clearance of 3.7 to 7.6 acres of vegetation, causing habitat to be lost or fragmented. Blowouts and spills often occur at the well site, causing chemicals to be emitted into the air and leak into the ground. This endangers groundwater and the health of people near the well. 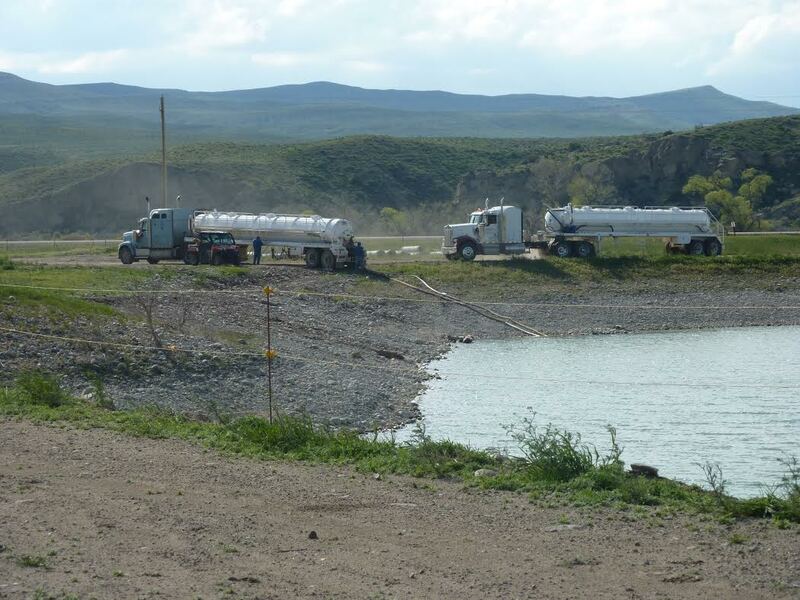 Wells require massive truck transport for supply of materials and water transport. A single well can require 800 individual truck runs. The truck runs tear up roads, and cause dust and other pollution. Well casing failure is a frequent cause of leakage, which can result in aquifer and groundwater contamination. 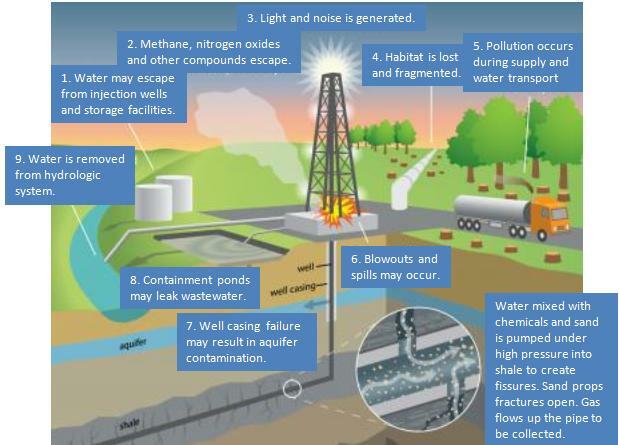 Causes of environmental damage due to fracking. Adapted from Frontiers in Ecology and the Environment and Princeton University PR Department. Q. Isn’t this all theoretical? Are there really documented cases of these impacts to people who live near oil and gas wells? A. You can read many documented personal stories on this site. These are real people whose lives have been affected by oil and gas drilling on or near their properties. Q. The oil and gas industry says that environmentalists use scare tactics instead of facts to try to block oil and gas drilling. Is that true? A. Well, these FAQs provide many links for you to see for yourself what’s true. If you read them carefully, you won’t see scare tactics, just a lot of facts. You also won’t see an attempt to block oil and gas drilling. What the Silvertip residents want is fairness for their community — an opportunity to preserve property, water, and a way of life. You should want that too. What has the oil and gas industry provided in the way of facts? A. You can tell the County Commissioners that you support the zone. Contact them by phone at 446-1595, or by email at commissioners@co.carbon.mt.us. The three County Commissioners are John Grewell of Joliet, Doug Tucker of Bridger and John Prinkki of Red Lodge. Tell them that the Silvertip Zone is critical to protecting our land, our water, and our way of life. A. You can use the search function on this blog to read for yourself. If you’re just beginning to find out about this issue, a good place to begin would be a pamphlet put out by the Union of Concerned Scientists called Toward an Evidence-Based Fracking Debate. It’s long on facts and a good primer on the issues. We have also set up another web site for you to do your own research. It’s important to understand the issues. You should also join Northern Plains Resource Council, which is leading the efforts in this area, or its affiliates Carbon County Resource Council and Stillwater Protective Association. Thanks to Hank Lischer and Maggie Zaback for their help in putting this FAQ together. This entry was posted in Community Organization, Politics and History and tagged Carbon County Commission, citizen initiated zoning, highest and best management practices, Silvertip community. Bookmark the permalink. The email for the commissioners is incorrect;my email to them was returned to me. Could you give the correct email? Thanks. I just tested it and it works for me. If anyone else has a problem please let me know. I would like to address a few of your concerns. I leave this message, not to troll in any way, but in hopes to clarify a few issues. I completely understand some of your concerns, and would like to try to alleviate a few of them. As a full disclosure, I am employed in the industry and have been active in the drilling process since 2005 throughout the western U.S. I fully support rigid regulations of drilling practices, as do most major operators. I suggest you delve into the COGC regulations for a good example of strict practices that protect landowners, make operators the best possible neighbors, and reclaim drill sites as much as feasible. 1) Minimum spacing. Well bores must be at least a mile apart. Incorporating this requirement into a best practices plan would greatly increase the surface disturbance of the drilling process. Current best practices are to drill 4-16 (and beyond in some cases) well bores from a single surface pad. What this does is minimize the surface disturbance to roughly 5 acres for those wells. Lets say 6 wells are permitted for a current operation. Spacing those well bores out a minimum of 1 mile would create 30 acres of disturbance, not counting access roads. This would also create 6 separate gathering, storage, disposal, trucking, etc issues. Drilling them from the smallest footprint possible makes the most sense. 2) closed loop systems: YES. The days of drilling through reserve pits are coming to an end. The practice is completely banned in Colorado, and the results do nothing but protect the land and wildlife populations. Cuttings are able to be land farmed and reclaimed, and less water is wasted. It is a great practice, and you should be fighting for it. 3) This is pretty much standard practice now, but a good inclusion. 4) While I understand the sentiment of this request, it is entirely too subjective. What are the requirements for “visual and scenic” impact? 5) Noise: This is an unrealistic expectation/requirement. Rather, look to colorado and their requirement of sound wall barriers constructed when well bores are within 750′ of a domicile. 6) water testing: Another good idea. Baseline water testing, as well as testing during drilling, completion, and production is becoming a common practice. Even if the operators are doing primarily to cover their hides against claims, it is beneficial for all parties involved–most water testing wells drilled are then handed over to the surface owners for private use as well. The 20 year stipulation may be excessive considering the lifecycle of a well. 7) air testing: another good practice. 8) soil testing: agreed up to a point. Testing near well bore is a good practice, but impractical along the entire lengths of a lateral well. The testing itself would be incredibly intrusive to property owners, depending on your testing intervals along a lateral that stretches beyond a mile. It would also be unnecessary based just on simple geology and physics–there isn’t going to be communicable contamination through a mile of rock to surface. Stick to near well bore requirements. The oil and gas industry has extensive water recycling programs and what it cannot recycle is cleaned and discharged to wastewater facilities for treatment or injected into approved wastewater injection wells just like other industry in Colorado that uses water to manufacture products. Now with some of those statistics stated, keeping water use in perspective as it relates to the process of fracking is a key to understanding this area. As you can see, the entire industry statewide uses about 0.1% of total water use in Colorado; and often recycles water for the new operation to further reduce water consumption. I know this is a highly emotionally charged issue on both sides, but hopefully, by debunking some of the pseudo/anecdotal science with actually authoritative sources, some of the “scare” factor can be reduced and your efforts can be focused where they will actually produce positive results. Thanks for your time. Thanks for a thorough and thoughtful response. Wouldn’t it be great if we could consistently engage the industry in rational discussion about how to make drilling profitable and safe? Unfortunately that’s not the environment in which we find ourselves. I will make sure your comments get to our planning team. The ultimate regulations for the zone will be a matter of public discussion, and it would be wonderful if someone from the industry would make these arguments so we could come to a best possible solution. What I expect is that the industry will say that no specificity is good. At any rate, thanks for elevating the debate.